A new and inscrutable (for me) piece of communication arrived from my apartment building's office a few weeks ago. Though a building newsletter mysteriously came and went last year, there still seems to be no shortage of news to relay, including that of semi-regular contests wherein the participants have a chance to win money off the rent. I'm all for money off my rent, but the contest terms always somehow prove to be too much for me to handle. One was an overwhelmingly diverse 24-item photo scavenger hunt. 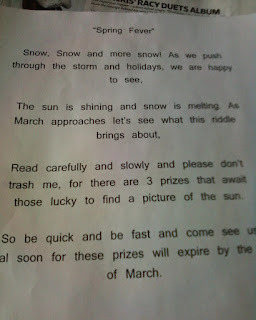 Another was called simply a "door contest," where we were told to "show what the holiday means to you." The grand prize was $500 -- a compelling sum, but the contest was worded so strangely that I actually had to have a chat with one of the office staff to make sure I understood it properly, and then I got too busy (read: lazy) to bother doing it. those lucky to find a picture of the sun. I went over this page more times than I'd like to admit, and for the life me I couldn't glean what the contest entailed. It seemed that we'd been challenged to find a picture of the sun, but I don't know whether that means taking our own picture or finding one that had been hidden in the building. Furthermore, I had no idea what this has to do with dropping off a form to the office, as no form was distributed with the notice. I also tried in vain to determine what poetic form this verse was. It seemed laid out so carefully, but no amount of scansion could slot this into any form I remember from my days as an English major. (Granted, I don't really remember that many poetic forms from my days as an English major, but still.) I guess it could be called free verse, and indeed, it is quite free with the commas and capitalization. In any case, the deadline has passed, and I have been yet again either unwilling or unable (in this case unable) to compete in the latest contest. could it be that the message came in an envelope and three tenants also found a picture of the sun in theirs, entitling them to a prize? That's good thinking but no, it was a sheet of paper half-slipped under everyone's door. I was keeping up the link as a vigil for the pbdotc. It is gone but not forgotten. Stuff I Know Is Ugly, but Keep Using Anyway.